Organic search is still the most effective channel for generating both overall and targeted web traffic. Social media unfortunately produces the highest bounce rates. In terms of customer generation, organic search and social media marketing drive in the most B2B conversions, whereas organic search is the most productive B2C channel. Email marketing generates the most qualified leads for B2B marketers, just edging out organic search and more than doubling both pay per click advertising and social media. While each channel has distinct advantages, it’s imperative to incorporate all four into your overall online marketing efforts to capture pertinent traffic, increase overall brand awareness, and generate conversions. 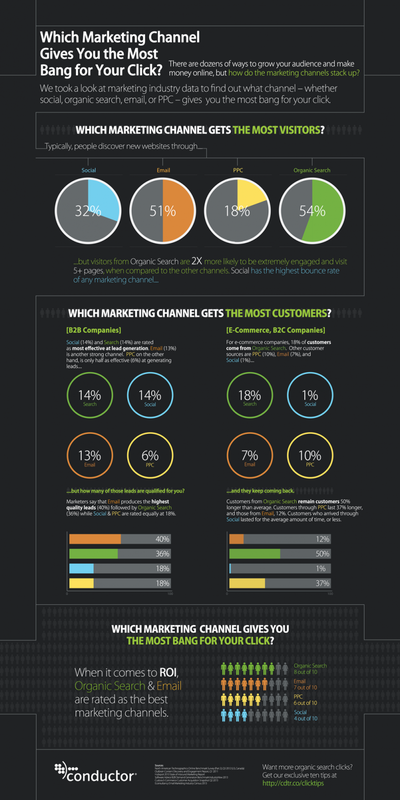 Which digital marketing channel is most effective for your business?